Since Eugene, Oregon, is not on the route from Colorado to Alaska, you may be wondering why we chose to stop there. When we knew we were going to spend the summer in Alaska, we bit the bullet and made an appointment at AM Solar in neighboring Springfield to have solar panels installed on our RV. Tim and I had hemmed and hawed for more than a year about whether to spend the money for solar, but finally decided that it would enhance our quality of life, especially in Alaska. On Monday April 27, we left Armitage Park in Eugene and arrived at AM Solar for a consultation. Questions had to be answered. What did we hope to accomplish with solar panels? 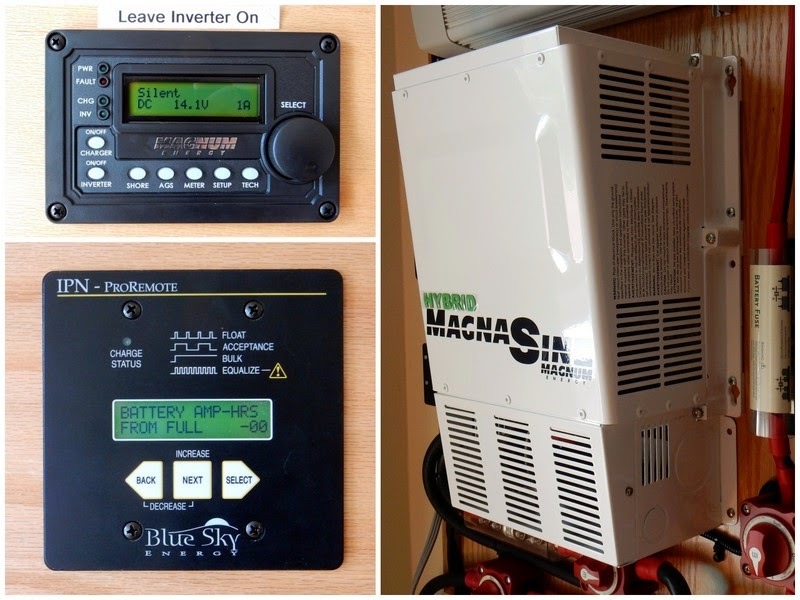 What was our typical usage, and what items did we hope to power with an inverter? We had a general idea, but really didn’t know what might be possible. Because our RV is so small, there is not a lot of room on the roof for solar panels. The original thought was that two 100 watt panels might fit. And what about an inverter? Did we just want to be able to charge electronics, or were we looking to plug in other appliances. AM Solar is one of the most highly-recommended outfits in the country for solar installation on RVs, and the folks there are extremely knowledgeable. They patiently answered our questions and tried to find solutions that would meet our needs and wants. We casually tossed around the possibility of a much larger inverter, as well as lithium batteries, but knew those items would greatly increase the cost, as well as take up more space than we expected. We left on Monday with a promise that a recommended solution would be ready the next morning. On Tuesday morning, we were presented with an ideal package to accomplish our goals. This included three GS 100 watt solar panels (lo and behold, AM Solar found room for one more), a Magnum MS2000 Pure Sine Wave Inverter, a 12.8 V-200Ah lithium battery, as well as assorted remote controls, a charge controller and battery system monitor. What had begun as a small, several thousand dollar project had morphed into one many times the original estimate. What to do? What to do? Tim and I accepted the fact our ideal system would be expensive, but we also knew that such a system would open up so many more camping opportunities for us. We wouldn’t have to worry about having electrical hookups each night. Instead, we could camp along a beautiful stream, or even beside the road if we were ready to stop for the night. We would be able to not only charge our electronics, but also run our coffeemaker, our microwave and even our small electric heater if we wanted to (just not all at one time!). This system represented freedom to us. We might never recoup our investment by boondocking, or camping without hookups, as much as some RVers do, but we would have the option of not having to worry about campground hookups. That is what sold us on the whole package. Besides, we had received a very hefty tax refund that would cover most of the cost, and a 30 percent investment tax credit for solar system installations would be available to us on our 2015 federal tax return. 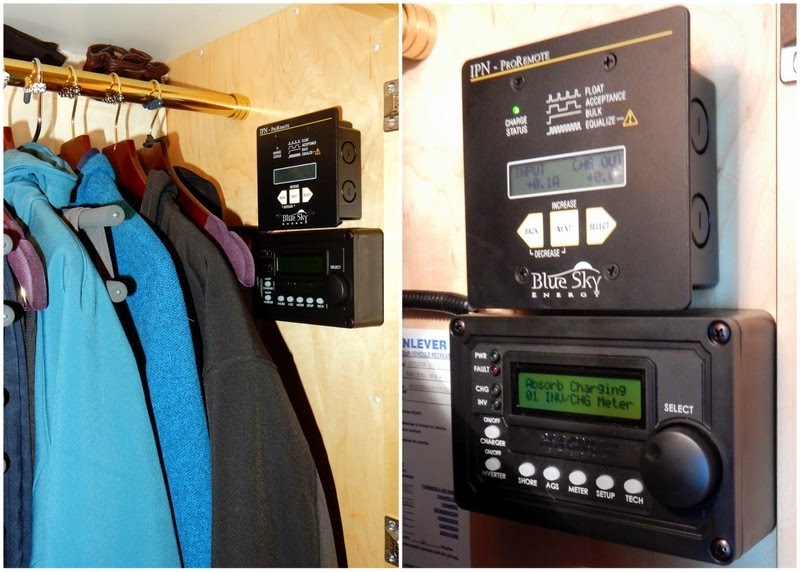 Tim and I certainly never expected to be on the forefront of technological innovations in the RV world, but that’s exactly what this system represents. Solar has been around for a long time, and many RVers have installed solar panels. What’s new, however, is the use of lithium batteries in RVs. Only a tiny percentage of RVers have installed lithium batteries. They have only been available for RV use for a short while, plus they are extremely expensive. However, they offer so many advantages over lead-acid or even AGM batteries, especially for small RVs like ours that have no room for a large bank of batteries. Lithium batteries charge much more quickly, and at nearly 100 percent efficiency, plus they can be discharged down to 20 percent, while other batteries should never go below 50 percent. They are almost worry-free and can be installed virtually anywhere. This, coupled with the solar panels, will practically double our power capacity. For all of these reasons, the decision to go with lithium was almost a no-brainer, at least once we got over the sticker shock. AM Solar had not originally booked us for such an extensive installation, but they promised to accommodate us and finish the job by the end of the week. We unloaded the RV to give them room to work and left our home in their capable hands. We then returned to the hotel where we would be staying for the week. There was simply no way we could live in the RV with the amount of work that was being done. Although we returned each day for a short visit to check on progress, we mostly tried to stay out of the way. While AM Solar was busy at work, we spent our free time finalizing a few chores and errands, as well as getting very short haircuts. I love mine, and I think Tim is getting used to his, but he remarked that his hair hadn’t been that short since he was a kid. I think it looks great, and both of our cuts will make RV living even more carefree. Friday afternoon was the big reveal, and we were so excited to see the finished product. Cody and Mitchell, who had worked their magic on the RV, spent quite a bit of time with us doing a complete walk-through. The system has so many capabilities, and I’m not sure I comprehend even the basics, but Tim understands these things much better than I. He also recorded the walk-through, plus we have a packet of manuals for future reference. I can’t say enough good things about AM Solar. Dave, Roger, Cody, Mitchell and the rest of the staff were great to deal with, and everyone was extremely careful while working in our home. I’ve also never seen a shop that is as clean and organized as this one. It really inspires confidence. We said our good-byes and headed off to the nearby Valley River Center mall that permits overnight camping in the parking lot. It was fun to keep an eye on the new monitors and watch the numbers inch upward as the sun continued to stream into the solar panels. This is going to be fun. The only downside to the solar installation is that we had to give up quite a bit of our already-limited storage space. Oh well, that’s the trade-off. The new lithium battery now makes its home under the ottoman that used to house our shoes. The inverter rests under the sofa where two storage boxes once contained extra food supplies. The monitors are in the closet. Our immediate challenge, therefore, was to find other storage options, or get rid of even more things. With a bit of creative arranging, we figured a way. We won’t be able to carry as many spare food or paper items, so we’ll just look forward to stopping at the store more often. Somehow, we will make it work. good to hear from you. Love the idea of solar.Pa. It was great to get together with you. Solar will definitely open up a lot more options for us. We're looking forward to exploring the capabilities.